Sixteen-year-old Kara is about to realize her dream of becoming a professional baker. Beautifully designed and piped, her cookies are masterpieces, but also her ticket out of rainy Seattle—if she wins the upcoming national baking competition and its scholarship prize to culinary school in California. Kara can no longer stand the home where her family lived, laughed, and ultimately imploded after her mean-spirited big sister Kellen died in a drowning accident. Kara’s dad has since fled, and her mom has turned from a high-powered attorney into a nutty holy-rolling Christian fundamentalist peddling “Soul Soup” in the family café. All Kara has left are memories of better times. Shannon Grogan is a second grade teacher who writes at night (and while her kids are at ballet and baseball) in a small logging town east of Seattle. She holds degrees in education and graphic design/illustration. When she isn’t writing, she’s baking, reading, watching scary movies, and wishing she were at the beach. You can find out more about her online at www.shannongrogan.com. From Where I Watch You is her first novel. "This powerful debut [will keep readers] guessing until the end, which is shocking as the final details are revealed . . . A suspenseful and fast-paced read . . . This novel will do well in YA collections where dark, realistic fiction is in demand." "The story builds and sustains tension deftly, offering just the right level of clues as to the identity of the stalker. Kara's love of baking is a nifty distinguishing feature, and the author includes her cookie recipe at the end. Involving and suspenseful." "A mingling of creepy and cautionary—everyone being so caught up in themselves they fail to see what is happening to those closest to them." 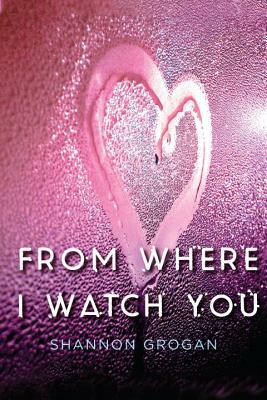 "From Where I Watch You is a delicious young adult suspense [novel]."